London, Studio International Publications, Ltd., 1972, First Edition. (ISBN: 0-902063-10-3) Stapled Printed Wrappers, Oblong 4to, np (24pp), 12 b&w illustrations. Text in English, French, German and Italian. In a protective acetate dustwrapper. 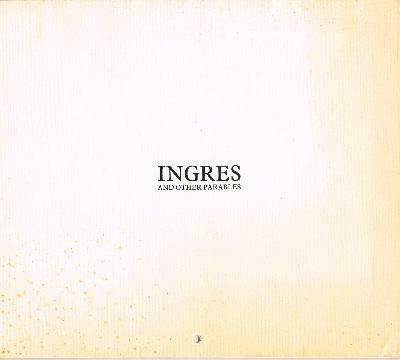 Published in 1971 by forward-thinking British art periodical Studio International, "Ingres and Other Parables" is pioneering Conceptual practitioner John Baldessari's very first artist book. It takes the form of a hole-punched hanging wall calendar that reproduces a stock photograph accompanied by a wry art world-related parable - with moral - in four languages for each month of the year. An internally most handsome example of this fragile, uncommon item that was exhibited as part of the Whitney Museum and Museum of Contemporary Art, Los Angeles' 1990 traveling retrospective showing some mild soiling, creasing, and a bit of foxing to its off-white covers along with a diagonal soft crease through one of the foredge corners of the textblock. PLEASE NOTE: Additional shipping costs are required for this item beyond our standard rates due to its value - we will inform you of the applicable amount at time of purchase.. Very Good.